Water balloon warfare meets the solo-catapult. The Wild Sling Solo achieves the same shock and awe as the traditional two-person balloon sling. 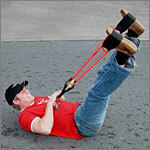 Capable of slinging water balloons over 120 feet – the operator lays on his/her back and employs all four limbs. Aside from achieving massive energy from the powerful elastic, you can also keep a low profile and attack in stealth-mode. For $19.95, you can have hours of endless entertainment as you soak anything within range. Finding newer and more powerful means of launching water balloons may seem childish and unbecoming of an adult with a mortgage, but then again, you’ll have the last laugh as you send the opposition running for cover. Just think about all of those toys that your parents wouldn’t let you buy as a kid – go ahead, you’re all grown up now. It’s OK, you can have it delivered to a PO Box if you’re still nervous your mother will catch you with it and take it away. Imagine the fun you’ll have off of the balcony of your apartment. My recommendation would be to buy one soon before they make water balloon radar or defense systems. Oh, and it comes with a carrying case. The Wild Sling Solo is available from Firebox for £11.95.